Nestled in the hills of northwest Okinawa, on the Motobu peninsula, is an idyllic vacation spot that takes visitors back to nature. Beach Rock Village is an experience unto itself. It’s hard to transform into words the experiences guests encounter while camping, fishing, giving river or horseback trekking a try, or simply relaxing and basking in the relaxation of a Hawaiian Lomilomi massage. For the true nature buffs, a trip to Beach Rock Village is an adventure off the beaten path that promises to test self-sufficiency in everything from fishing to farming to taking care of animals. Planting your own foods, then growing them to a harvest point may sound like work to some, but to others, it’s sheer pleasure. It’s possible at Beach Rock Village, and plenty of guests dive in, tilling the land and absorbing agricultural experiences that blend with ecological promotions. If cultivating a plot of land isn’t your cup of tea, no sweat! Sit back on the terrace and simply sip your cup of tea. The Tree Terrace Café is built on the branches of a sprawling tree, offering continuous exposure to both the sunshine and the soft breezes. What’s more, the ocean view from the treetop is exquisite. Beach Rock Village offers five cafes and restaurants, each a tantalizingly bit different. The tent bar, built in the teepee style of a nomadic tribe, is an expansive bar offering the world’s great beers and rums, along with Okinawan awamori. Toss in the music and you’ll never want to leave. The garden barbeque is exactly that, an outdoor barbeque where it’s possible for guests to cook up whatever they want. Inside the nearby farmyard, fresh, organic, homegrown foods are waiting to be snatched up and whipped into a meal, right there in the garden. And for those who find their own cooking a bit daunting, the Cottage Restaurant is more traditional, with a courteous wait staff eager to serve. Guests often don’t want to budge from their seats in the Cottage Restaurant, because the view of the valley and the forest is breathtaking. It’s a great place to try Beach Rock Village’s organic coffee. Beach Rock Village is a place to stay for a day, for a week, or for more. It’s all up to you. What’s more, the vacation can be in a cottage, in a nomadic style tent, or in the tent village, and prices are more than reasonable. 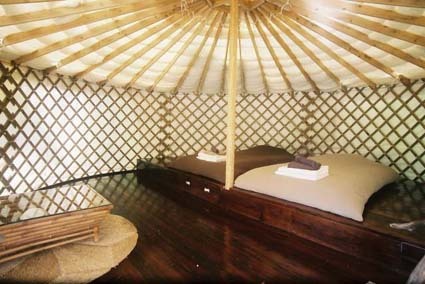 The nomadic style tent is, as we said earlier, a tribal style tent with the inside jazzed up, adding to the original art. It’s a perfect place to meet and greet friends, get to know strangers until they become friends, and to simply enjoy the atmosphere. Lodging in the nomadic style runs ¥6,000 per person per night, and that includes two meals at Beach Rock Village. During the high season August 1st ~ September 30th the price is ¥7,000 per night. During the off season, November through February, the price dips to ¥5,000 per person per night. Nature cottages are similar, with a regular season nightly price of ¥5,000 per person, and that also includes two meals. 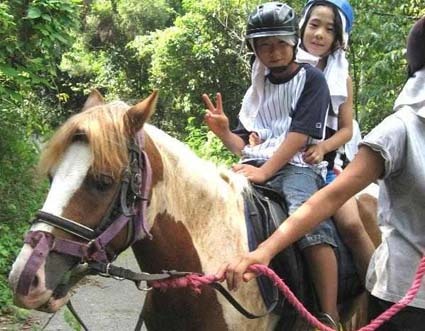 The log house type cottages are tucked into the beautiful green forest, with a panoramic view of the forest world of Okinawa literally at the fingertips. The high season price is ¥6,000, while off season rate is ¥4,000. The Beach Rock Village tent village is available for the outdoorsy types. The price year-round is ¥690 per person per night. 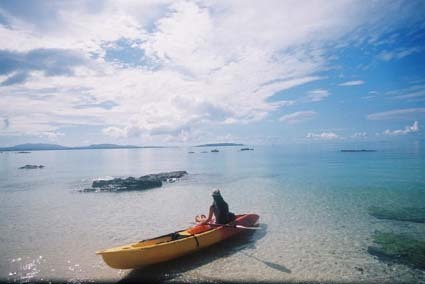 Beach Rock Village is located in Nakijin, on the Okinawa northwest side. Take the Expressway to Kyoda, then Highway 58 to Nago. Once through the city, turn onto Highway 84 headed toward Motobu Town, past Okinawa Pineapple Park, before looking for Route 72. At the Route 72 traffic light, head toward Nakijin, passing through Kogayama Tunnel. Just before a second tunnel, Otoa Tunnel, look for the sign pointing right to Beach Rock Village. The telephone number to Beach Rock Village is 0980-56-1126.